Don’t be surprised at NASCAR’s aggressive policing of the video of a crash at Daytona that injured more than 20 spectators. NASCAR pulled its own video of the crash, and YouTube pulled a fan video, which showed a tire landing in the bleachers as fans are scattered like bowling pins.NASCAR has a little-known, longstanding policy of saying as little as possible about the safety risks inherent in its sport. This, after all, is the sports league that withheld confirmation of Dale Earnhardt’s death from his own fans for two hours after track officials first laid eyes on the racing star’s bloodied corpse. It’s also the only major sports league where the expected penalty for making a mistake — or even being unlucky — is death. 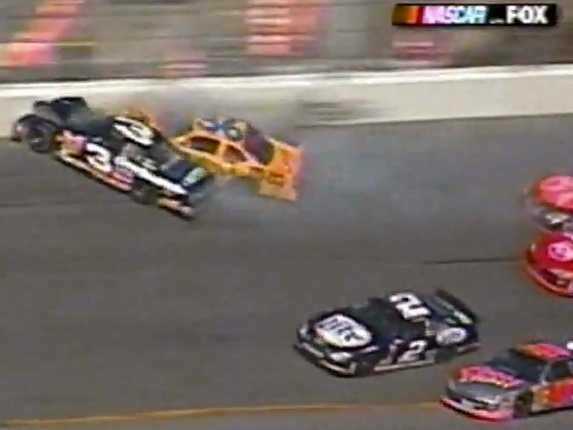 Ironically, yesterday’s crash occurred on the eve of the 12th anniversary of the 2001 Daytona 500 race which killed Earnhardt, the most famous NASCAR driver ever. That incident pulled back the curtain on NASCAR’s non-transparent maneuverings when it comes to crashes. In yesterday’s crash, NASCAR claimed copyright ownership of a fan’s video of the race. The company — NASCAR is a privately held, for-profit firm, controlled by the France family — also briefly published and then deleted its own video of the crash, according to The Atlantic. The videos have since made it out onto the web in various versions. Immediately, NASCAR track officials worked to obscure the view of Earnhardt’s wrecked car. CNN reported, “workers draped a tarp over Earnhardt’s car like cops covering a body at a crime scene.” NASCAR took two more hours to officially confirm that Earnhardt had actually died. Fox TV completed its coverage of the race before the bad news was released. Earnhardt had not been wearing a head and neck restraint system (HANS) — literally a protective cage that prevents a driver’s skull from being ripped off in a crash. NASCAR had not required HANS use prior to the race, even though the sport had debated it in the months prior after other drivers had died of the same injuries that killed Earnhardt. 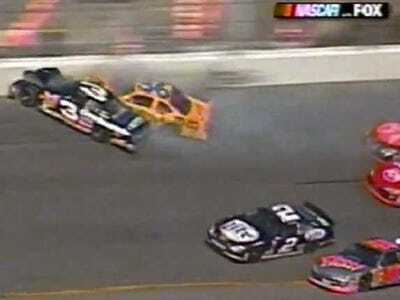 (Adam Petty was killed in 2000 as a result of the same injuries that Earnhardt suffered, for instance.) NASCAR president Mike Helton declined to answer questions about HANS at a press conference after Earnhardt died. Helton also failed to tell the media that Earnhardt’s seat belt had malfunctioned until four days afterward, even though officials knew the belt had been severed on the evening of the crash. NASCAR said later it was trying to figure out whether the belt was cut by emergency workers or whether it had failed in the crash — the latter turned out to be true because it had been improperly installed. Finally, NASCAR’s in-house doctor — the man who declared Earnhardt dead at the track — delivered a description of Earnhardt’s injuries that triggered a lot of questions in the days following. NASCAR was defended by fans who were outraged that reporters — particularly Ed Hinton of the Orlando Sentinel — sought copies of Earnhardt’s autopsy photos in order to independently check NASCAR and the Daytona County medical examiner’s conclusions about Earnhardt’s injuries. Reporters wanted as much detail as possible about whether HANS could have kept Earnhardt alive, and the role of the seat belt. Later that year, Florida’s state legislature changed the law to exclude autopsy pictures from its open public records act. That’s the backstory to NASCAR’s reticence when it comes to crashes.